Summary: One choice could destroy them all. When eighteen-year-old Levi returned from Denver City with his latest scavenged finds, he never imagined he’d find his village of Glenrock decimated, loved ones killed, and many—including his fiancée, Jem–taken captive. Levi is determined to rescue what remains of his people, even if it means entering the Safe Lands, a walled city that seems anything but safe. Omar knows he betrayed his brother by sending him away, but helping the enforcers was necessary. Living off the land and clinging to an outdated religion holds his village back. The Safe Land has protected people since the plague decimated the world generations ago … and its rulers have promised power and wealth beyond Omar’s dreams. Meanwhile, their brother Mason has been granted a position inside the Safe Lands, and may be able to use his captivity to save not only his people, but also find a cure for the virus that threatens everyone inside the Safe Lands. Can Mason uncover the truth hidden behind the Safe Land’s façade before it’s too late? What I Loved: Jill Williamson absolutely knows how to write from a male character's POV (point of view), and she does it very well at that! The dialogue from Mason, Levi and Omar (the brothers that the story is primarily centralized around) was great, and completely believable. The prologue was stellar - really plunged you into things at warp speed, and I wasn't complaining one bit. The Safe Lands is a completely unique 2088 world . . . full of Wyndo's, SimTags, Roller Paint, the To Dye For Salon, CompuCharts, GlassTops and a couple of wacky reality television hosts named Finley and Flynn. That said, this was probably one of the more unique "worlds" I've dived into in a long while - everything was true to Safe Lands form and remained that way throughout its entirety, which gave this novel a great sense of realism in its own rite. I was really excited when Levi, Jemma, Mason and Ciddah became a more prominent part of the story in the later chapters, as I found myself growing quite attached to these 4 characters in particular. Speaking of characters . . . I really liked any snippet where I got to hear about Bender. Yes, I love me some rebels! I admit it. I really wanted to know more about him (and Arris and Lonn) and the rest of his rag-tag crew, and about how the Black Army had evaded The Enforcers' rules and watchful eyes for so long without being noticed. Quite frankly I wanted to be a fly on those underground Safe Lands walls! I'm really looking forward to seeing where Jill Williamson will take the story in the next installment! What I Didn't Like So Much: I almost wanted to stop reading quite a few times, mainly due to "the horror of it all," as my dear friend Rachelle Rea puts it. This book was dark. It was hard to stomach at times. And oh, how I shuddered at so many turns! But maybe that is the point that the author was trying to make? That life can be dark - really dark. Life is chock full of vices, and it surely isn't always pretty - especially for our captive characters, some of which try desperately to blend in with The Safe Landers. People, including the characters in Captives, don't always make the right choices - the choices that we think they should make. But therein lies a house of redemption for all sinners, Safe Landers and otherwise. I’m recommending this book… Keep in mind that while this book does contain some mature content (that may be inappropriate for younger teens) this book is ultimately founded upon a Christian Worldview. 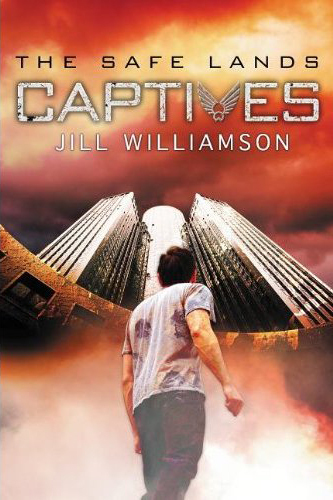 If you loved reading The Hunger Games Trilogy by Suzanne Collins and The Giver Series by Lois Lowry then you'll most likely enjoy reading Captives by Jill Williamson too. 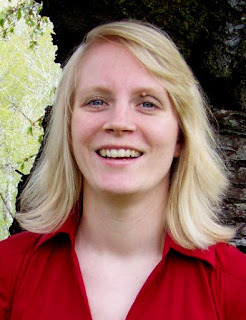 About The Author: Jill Williamson is an author of all things weird. She grew up in Alaska with no electricity, an outhouse, and a lot of mosquitoes. Her Blood of Kings trilogy won two Christy Awards, and she recently released Captives, a dystopian teen novel from Zonderkidz. Jill lives in Oregon with her husband and two children and a whole lot of deer. Extras for Captives . . .
Also, check out these other Team Novel Teen bloggers ( below ) to see what they had to say about Jill Williamson's new novel, Captives. The Giveaway . . . I was kinda scared to read the end because I just knew it would be a cliffhanger, and it was darker than what I would normally read. Great job! Oh, me too, Faye! Me too! Yes, I was thinking about Effie Trinkett (and Caesar Flickerman) too a bit whenever Finley and Flynn were mentioned! And your recommending bit made me smile, too. Exactly. Exactly. I hope we see more of the rebels too (and I'm sure we will.) They definitely have captured my interest. Great review! Sarah Elizabeth -- good review! You pointed out many things that I thought about . . . I've read a few dystopian novels in the past year or so. I think for a middle school read, I like SWIPE by Evan Angler and for a high school read, CAPTIVES. Yes, I so agree. Swipe for the Middle Schoolers and Captives for the High Schoolers.